As well as strange paths in the settings file. I have the same error on Windows 10! A couple of updates happened recently both to Visual Studio Code and to Windows itself. Maybe they were the cause? The extension crashes when it is passed 8.3 filenames. The question is, why PlatformIO passes 8.3 filenames to this extension instead of full ones? Setting the extension update channel (c_cpp.UpdateChannel) to insiders and updating the extension fixed the error for me. Alternatively, rolling back to a previous version might help (but I didn’t test this). I’m having this same problem and it’s maddening. What do you mean by " Setting the extension update channel ( c_cpp.UpdateChannel ) to insiders and updating the extension"
How do you do this? I have no idea where C_cpp.UpdateChannel is located. Can you further detail how you did this? Thanks! 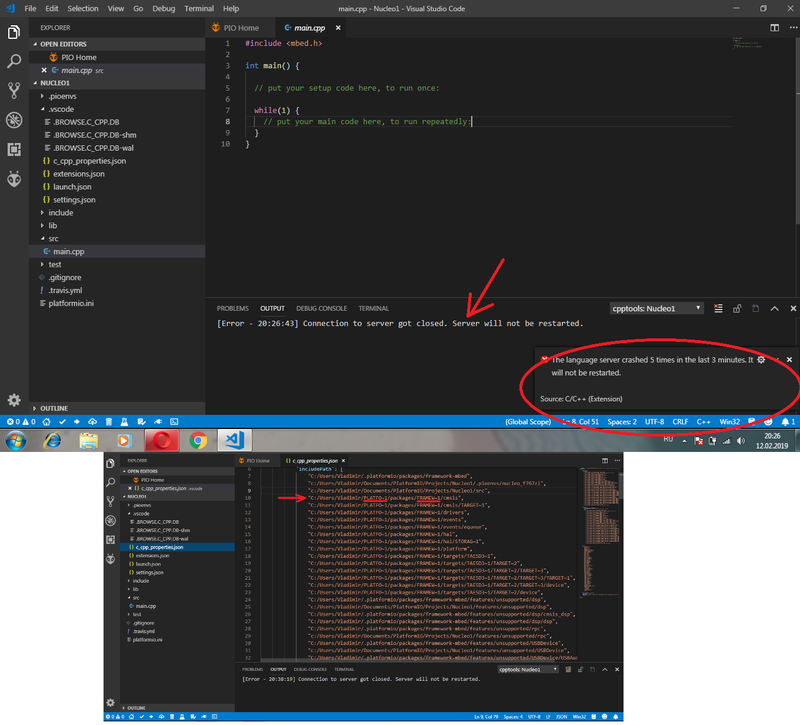 Open Visual Studio Code parameters and enter parameter name into search field. Thank you so much for investigation. Yes, we use “8.3 filenames” because “Windows is the best OS in the world” It has CLI limitation. ARM mbed OS has a lot of includes. Nevertheless, we have fixed this issue on our side. We return full path for VSCode now. Please update packages via $ pio update in IDE terminal or PIO Home > Platforms > Updates. PIO Core Call Error: "Error: Unknown development platform 'C:\.platformio\platforms\ststm32'"